Despite suffering a disappointing 2-0 defeat to Burnley on Saturday, Wolves still sit seventh in the Premier League table on goal difference and their FA Cup dream is well and truly alive. You can’t win them all and I’m sure if Wolves win their semi-final on Sunday this result will be the last thing on anyone’s minds. Let’s take a look at the statistics from the match to find out more. With Burnley fighting to stay above the drop zone and many of Wolves’ key players just returning from their international duties, this was always going to be a tough match. Regular starters Matt Doherty and Raul Jiménez were rested, with Adama Traoré and Ivan Cavaleiro coming in to replace them. 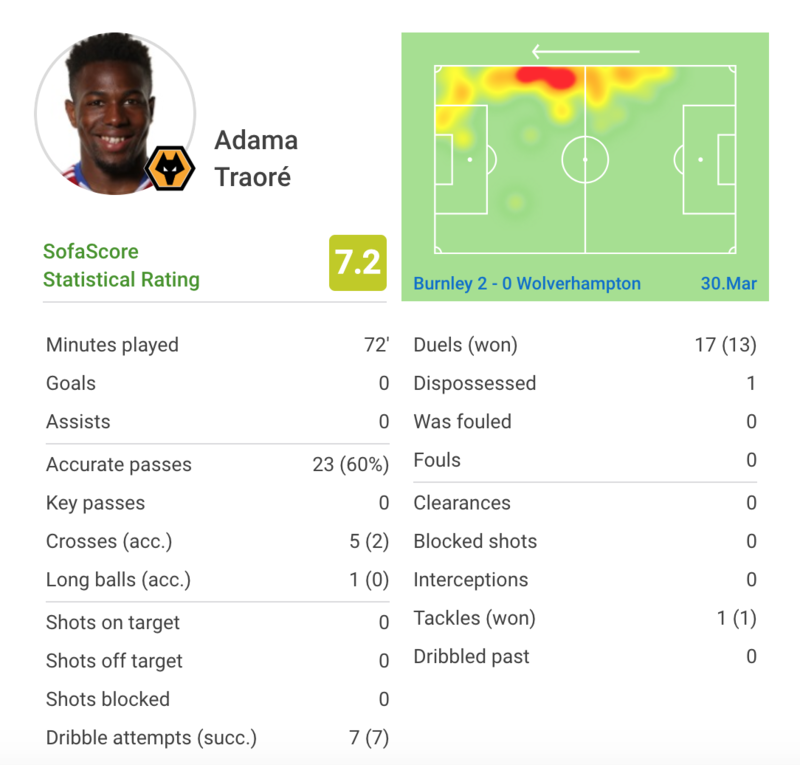 Wolves had 63% of the possession with 77% passing accuracy, and while it was only one-nil it looked like they could get back into the game. They had eight shots, which is more than Burnley managed, one of which was on target. 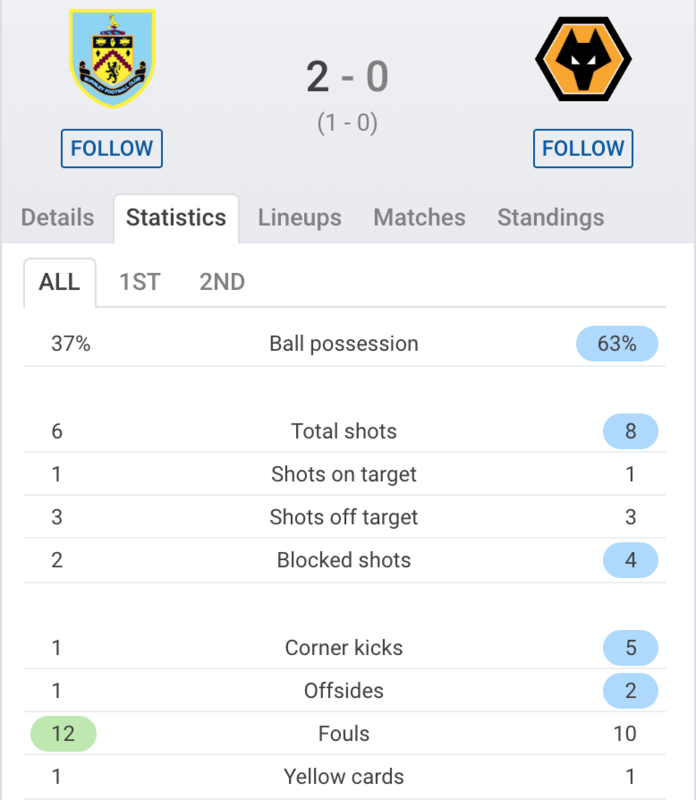 The main problem for Wolves was accuracy, three of their shots were off target and Burnley’s goalkeeper only had to make one save all game. They also only managed six accurate crosses out of 22 attempts and their accuracy on long balls wasn’t much better (24 out of 63). Maybe it was tiredness from the break, maybe it was the fact that they have another two big games coming up, who knows. One thing that’s clear is when Burnley’s second goal went in, there was no coming back for Wolves. Captain Conor Coady went down with the ship, so to speak, after a performance he’ll probably want to forget. He scored his third own goal of the season, which is not a statistic you want to be lumbered with, and it was all a bit downhill from there really. His overall passing accuracy was only 78% with his long-range passing accuracy not much better. Only three of his 11 long ball attempts were accurate. He also won no duels and no tackles. Traoré seems to improve a little more each time I see him play. Against Burnley, he put in a really good performance and was actually one of the best Wolves players on the pitch. I was gutted when Nuno subbed him for Helder Costa as he was having such a good game. Despite only having a passing accuracy of 60% it was what Traoré did with the ball that was so impressive. He made seven dribble attempts all of which were successful. He was so good at making runs and getting past the Burnley defence, and when he was on the pitch Wolves looked like a real attacking threat. His main downside is his crossing. He only managed two accurate crosses into the box out of five attempts which shows there is still room for him to improve, but considering where he was a few months ago he’s miles better. He also won 13 out of 17 duels, one tackle and was only dispossessed once during the 72 minutes that he played. With a mid-week matchup against Manchester United and the FA Cup semi-final against Watford on Sunday, this was the start of a big week for Wolves. Sadly, it started off with a loss instead of a win but, hopefully, Nuno can turn it around on Tuesday night under the Molineux floodlights. Can Wolves Banish The Blues?